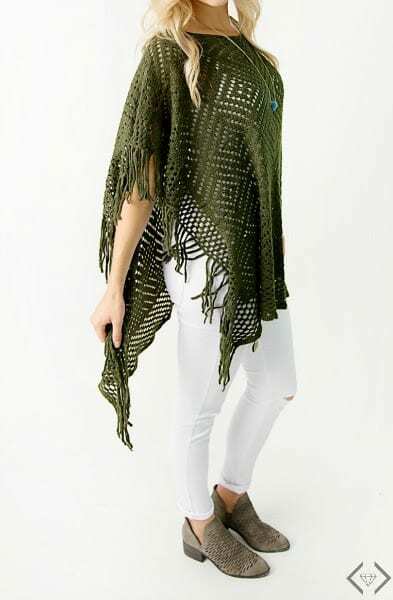 Are you looking for ideas on how to wear a poncho this fall? 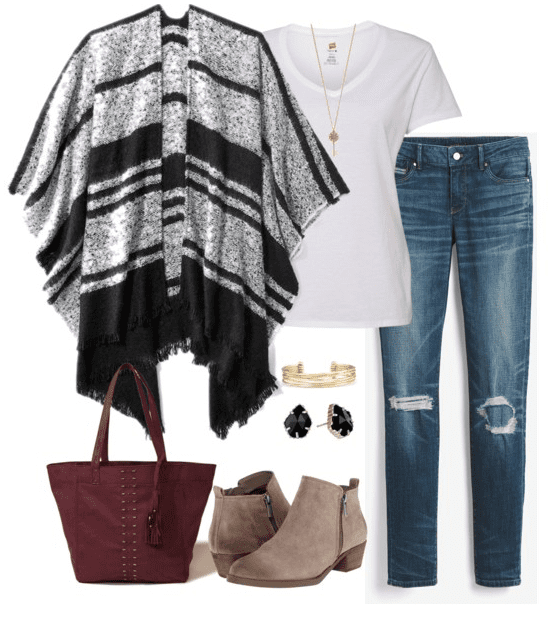 These poncho outfit ideas feature several different patterns and styles of ponchos, plus pairs them with three different colors of denim. 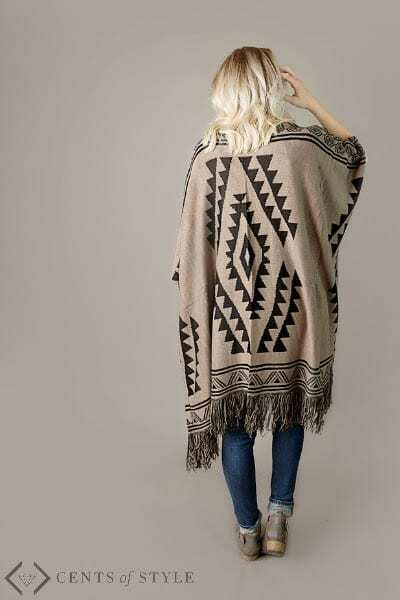 A poncho is such a fun addition to your fall wardrobe. 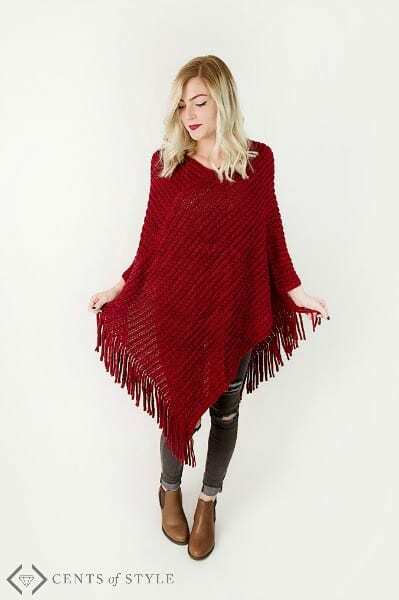 The good news is the poncho trend hasn’t gone anywhere and it’s still a fun way to add some fall style into your wardrobe. If you’re looking for just the right poncho outfit, keep browsing below because I’m sure you’ll find one or two you like. 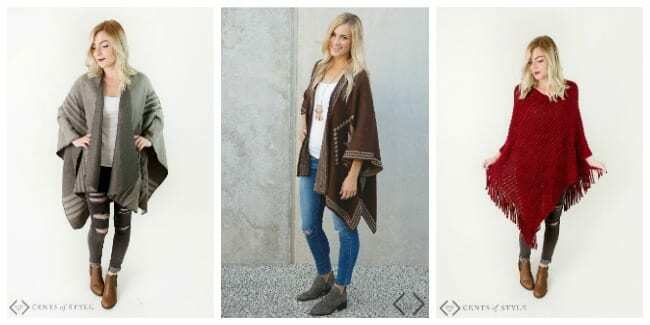 Before we get to the poncho outfit ideas, one of my favorite online shops to purchase clothes and accessories, Cents of Style, is featuring some incredible new ponchos, wraps, and kimonos. Plus, starting today and going until Sunday, September 4th, use the code FALLING4 to take 50% OFF the lowest marked price in the cart. Pair your favorite poncho, wrap, or kimono with wide-leg or flare jeans for a bewitchingly bohemian look. A white tee and jeans is an easy, everyday look. Make that white tee a graphic one and pair with a kimono for a seriously on trend style. Break up a monochromatic outfit! Imagine all white with a gray sweater kimono over it. It’s modern and hip, and totally on our list. Ankle boots! They are the perfect finishing touch to an outfit centered on your brand new poncho, kimono or wrap. Take a lighter weight kimono, belt it over a solid tee and wear with jeans and your must-have riding boots. It’s the best way to carry those Summer kimonos into cooler weather. Tell me, what’s your favorite fall item to wear?